Profile of Backward Flag, a craft brewery in New Jersey raising the flag for female brewers everywhere. 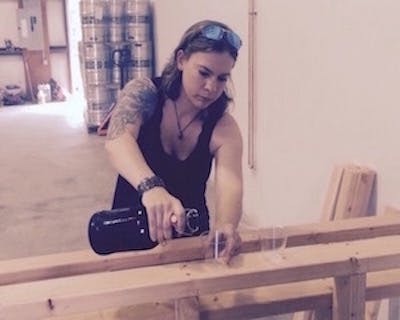 Today we profile Torie Fisher, owner of Backward Flag Brewing Company and a craft brewer who's helping to raise the flag for all female brewers in New Jersey. Fisher also happens to be an aviation veteran, as well as a full-time mom. From her introduction to craft brewing in Wiesbaden, Germany, to launching a business proud to display its New Jersey roots, Fisher’s tale is one of passion and undoubtedly, many hats. As one of only two women in her field of Army Aviation (a Blackhawk Helicopter Crew Chief) and a budding Cicerone, Torie is used to defying biases, as well as industry trends. Similarly, despite spending time serving far from home, her focus now is on serving something that speaks to the local crowd. 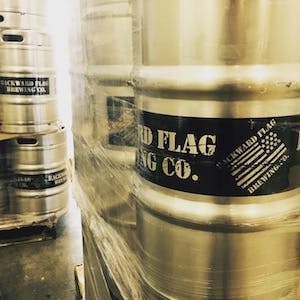 Backward Flag is a brewing brand with a profile that “everyone can rally behind”, with an emphasis on “always moving forward and never retreating”. The result is an independent New Jersey brewery whose mission is to bring communities closer together. 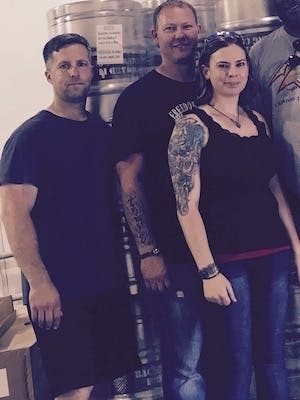 Backward Flag’s story began in 2007, when a partnership forged between Torie, her husband, Charlie, and fellow veteran, Christopher Deangelo, who later became their business partner. The Fishers, both beer enthusiasts, decided to learn the art of brewing with some help from a home brewer friend. However, when bottling day came, their initial results were disappointing (to say the least). But rather than admit defeat, this prompted the Fishers to learn more about the craft, investing in books and equipment to help refine their skills and knowledge. Torie was on the road to becoming an accomplished female brewer. Then, two years ago, the couple began investigating the possibility of opening a brewpub. It felt time to take their plans to the next level. Torie, motivated by a passion for fine gastronomic flavors, working with the community, and her thirst for getting the most out of life, started to work nights at a local restaurant. In the meantime, while the couple both worked full-time, they started a family, as well. Thanks to helpful guidance from New Jersey's ScoreOffice, satellite bureaus of the Small Business Association manned by business-savvy volunteers, Torie realised the economics of running her own restaurant would be prohibitive, for several reasons. It would mean less time interacting directly with the community, one of the couple’s main motives for brewing. With their retirement money invested in the business, the Fishers decided to raise capital for a microbrewery instead. The plan would enable them to continue working their day jobs, while also growing their business in a scalable way. That was when the Backward Flag team, co-led by head brewmaster Charlie Fisher, really began their journey. The result is a New Jersey brewery offering a bevvie of American-style beers that speak to both the couple’s patriotism, as well as their sense of community. It's also a beer founded by a strong female brewer who's unafraid to learn new aspects of the craft. Overall the team's main goal is to “drive experiences" by creating moments centered around sharing a beer that brings people together. As Torie puts it, “we’re raising the flag for American beer” (and, we'd argue, for female brewers too). So far, Backward Flag has tested homespun brews such as “Stakeout Beer”, a brew dedicated to local law enforcement. The beer is an Imperial Cream Stout brewed with coffee and conditioned with blueberries and cherries, it's colors reminiscent of the lights on a police patrol car. Torie, who manages the design and branding side of the business, worked with a designer to get some labels made up, and then handed out the beer to local friends in the force. The messaging was, “Share this bottle with someone you can share your stories with”. Unsurprisingly, the beer was an instant success! Now, Torie pours back into her New Jersey community as a shining example to other female brewers. She provides counseling and mentoring to fellow female entrepreneurs keen to raise their brewery's profile too. Backward Flag opened their tap room in September 2015. Thankfully, Kinnek was there to help Torie fulfill her goal. “The service is efficient - anytime there are any issues, it’s great to get a phone call from Kinnek. It’s a relationship, not just a business transaction.” She’s even so bold as to claim that Kinnek “saved [her] life”. Coming from someone who’s been out in the field saving others, that’s one of the highest honors we can imagine. We’ll say an even bigger cheers to Backward Flag when they open their doors this Fall. In the meantime, we’re proud to serve those who are also serving their community and their country.